France's right-wing National Front party, the leader of which, Marine Le Pen, is running for the presidency this year, is "the only force" that can get France out of the EU and help protect it from radical Islam, politician Marion Marechal-Le Pen told RT. "Currently, we are the only political force in France that promotes a sovereign project, based on [the idea] of Europe made up of national sovereign states," the National Front (FN) member said. Marion Marechal-Le Pen added that "there are no other candidates" supporting the same ideas as her aunt's party, who can boast "a potential possibility to take part in at least the first round" of the French presidential elections. Another French presidential hopeful, Emmanuel Macron, a former economy minister under president Francois Hollande, who has recently lashed out at the EU project at a rally, "has not changed his views" as a europhile, the granddaughter of FN's founder Jean-Marie Le Pen said. "Emmanuel Macron has no wish at all to question the core idea of European federalism, the idea of European government, the euroze and the Schengen zone," Marion Marechal-Le Pen told RT in Lyon where Marine Le Pen launched her presidential campaign on Sunday. While Marine Le Pen has already released a manifesto that highlights abandoning the euro and a possible vote on exiting the EU among some of the key proposals, Macron is in no rush to present his official manifesto, the FN politician said. "It's a great talent of Emmanuel Macron to create an imitation of a program, which is in fact based on total emptiness. His program is a real marketing product, said to be something new, but in fact he's been doing the same thing since he was a minister in the Manuel Valls government. I honestly think he will not succeed in converting his purely marketing product into electoral votes," Marion Marechal-Le Pen said. There is little known about Macron's program, she added, saying that among a few things that can be understood so far are his favor for "total liberalization of the economy" and support for gay marriage and other LGBT rights. "I also think that he stands for protecting immigration, and thus is against expectations of the majority of the French people," Marion Marechal-Le Pen said. Meanwhile, "drastically limiting immigration" is among the main points of Marine Le Pen's program, the politician said. "We want to get out of Schengen, regain control of our borders and know who goes in and out" of the country, she told RT, adding that her party "also wishes to have an extremely tough policy" on Islamists. There are plenty of projects in France financed by the Qataris and the Saudis, she said, adding that the FN party seeks to close down "all organizations that are in touch with radical Islam." The party also "wants to deport the radical imams," she said. Speaking at a thousands-strong campaign launch rally on Sunday, Marine Le Pen announced that she alone - if elected president in May - could protect the French people against Islamic fundamentalism. The promise was greeted with the crowds chanting, "This is our country," Reuters reported. 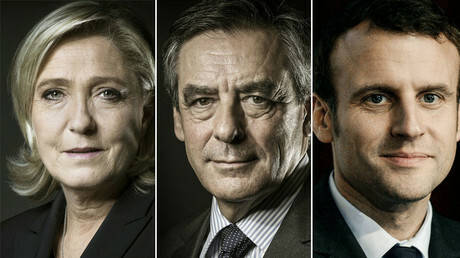 National Front policy proposals have been used by other French political parties, both left and right, the party general secretary and MEP Nicolas Bay told RT. Yet, he added, if they succeed in getting into power, "like Nicolas Sarcozy in 2007... [the other politicians] do exactly the opposite" to what they've promised. "I think the totally disoriented right and left use our ideas in every campaign, to have a chance to be elected. 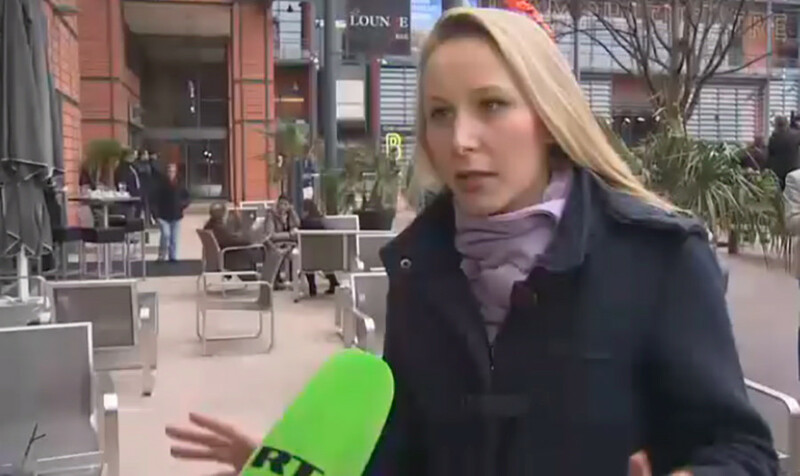 But the French people know that those [politicians] have done nothing," Bay said. 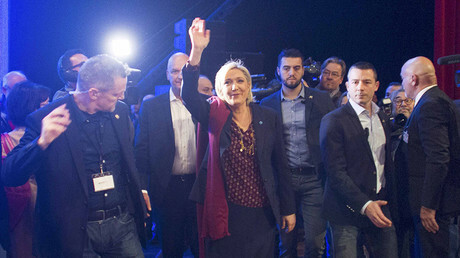 Marine Le Pen is expected to become the frontrunner in the first round of the elections in late April, according to a recent poll by international Ifop research firm cited by RIA Novosti. Yet, the poll has shown that the National Front leader might lose in the second round in May to Macron. Ratings of another candidate, France's former prime minister, Republican Francois Fillon have dropped following a scandal involving corruption allegations against his family members, the poll showed.